I’m sure you’ve heard of the adult coloring book craze going on these days. Many are raving that coloring helps them to reduce their stress + anxiety. Expressing oneself creatively is also something that I find satisfying and gratifying. It’s great to finish a piece of artwork and look back and think “Wow. I made that.” That sense of pride isn’t something you can buy. Well, if you love coloring pages, you’re going to LOVE what I’ve got in store for you. 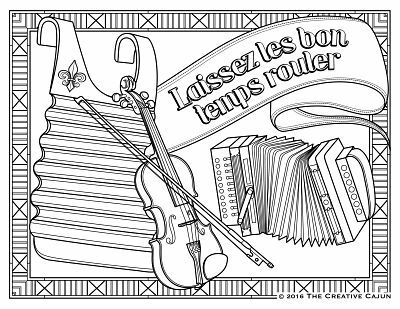 I’ve worked with a designer to create 5 coloring pages that celebrate our Cajun culture. These pages will be available as a free download to everyone on my email list next week. To kick off this exciting project, I’m hosting 2 coloring parties in Lafayette + Baton Rouge where you’ll get to see the designs before anyone else. I have free, high quality printouts of the 5 coloring pages, markers + colored pencils for you to come and enjoy some craft therapy and meet me in person. I’ve spoken before of craft therapy. Many people are fearful that they’re not talented artistically. I ran into this excuse when I planned an outing to lunch + a painted pottery studio. Many of the women committed to joining us for lunch, but remarked that they’re not artistically gifted, so they weren’t going to paint pottery with us after lunch. I thought to myself “Wow. I don’t want my fear of perfection or not having enough talent keep me from having a little bit of fun.” I was a bit sad that someone doesn’t even want to explore their creative side for not being good enough. I think creativity really blossoms when we release our expectations and just listen to what our heart is telling us to create. Coloring pages are a great solution to craft therapy without the pressure to be artistically gifted. The coloring pages are low cost and low risk. If you color a page that you don’t like – it’s just a sheet of paper and some colored pencils, crayons or markers. It’s nothing to get upset about. You didn’t invest a ton of time nor money in the project. You’re learning through your creative expression. What’s to lose – just a bit of stress + anxiety. It’s been a stressful few weeks here in my home state. I think we could all use a bit of stress relief these days. What’s your favorite way to relieve stress + anxiety? It’s about time soemone wrote about this.